Stand is an original symphony for jazz orchestra in five movements, composed and arranged by award-winning, New York composer, Anita Brown. Conceived as a piece of performance art, it was premiered as such by Anita Brown Jazz Orchestra , featuring The United States Marine Corps Silent DrillPlatoon from Marine Barracks, Washington, DC on Saturday, September 10, 2011 in Memorial Park, Nyack, NY on the banks of The Hudson River. It was free and open to the public. Deepest gratitude to Nyack College for allowing us to secure Bowman Gymnasium as our inclement weather location. This unique piece of performance art commemorates and depicts the American experience of the events of our national tragedy of September 11, 2001 and its effect on our nation’s psyche. Please browse this site, dedicated to this unique world premiere. You will find information regarding concept, research, estimated expenses and how you can make a tax-deductible contribution to the on-going project. Videos of the premiere of Stand are now available both in the home page news/blog (scroll back some) and on the video tab. Several photo galleries are also posted at the photo page, see tab above. The concert program is downloadable in the right margin and is very informative. The September 10th event was not a fund raiser. Rather, this premiere production of Stand called upon New York’s finest musicians, The Marine Corps Silent Drill Platoon of Washington, DC and a Firing Party of seven Marines from The 6th Communications Battalion of Brooklyn, NY to come together in concert, to offer the public this unique and original piece of performance art. 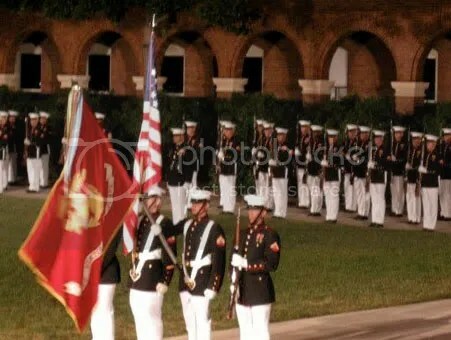 The Marines from Brooklyn provided a color guard and a firing detail of seven Marines firing three volleys (shots) at the start of Movement IV. Valor, thus assisting me in rendering full military funeral honors, usually reserved for career military personnel and statesmen, to honor all victims and fallen heroes, in both local and international theaters, who lost their lives to The War on Terror. The Silent Drill Platoon’s drill, in silence, provided the most dramatic effect available in any piece of music, while simultaneously offering strength, healing and resolve to the audience. As the Marines are our nation’s first responders, I felt strongly that it was right to employ this most spectacular ceremonial representation of our militaryto represent all first responders in the scope of the piece. Donations supported the mounting of this production, as outlined on theContributor page. Contributions made after September 10, 2011 will be put toward forthcoming performances, a studio recording, possibly a commercially available DVD of the event itself and related expenses.